Kinshasa 12-04-2019 Politics - The Head of State is traveling for a first official visit inside the country. These are new horizons that will open Felix Tshisekedi during his three days stay that began Friday, April 12, 2019. His agenda provides for a meeting with senior executives involved in the operation of the Kasumbalesa border crossing. The President of the Republic will take advantage of his first official exit to the interior of the country to bring together all stakeholders concerned with the operation of the very strategic port located on the border with Zambia. 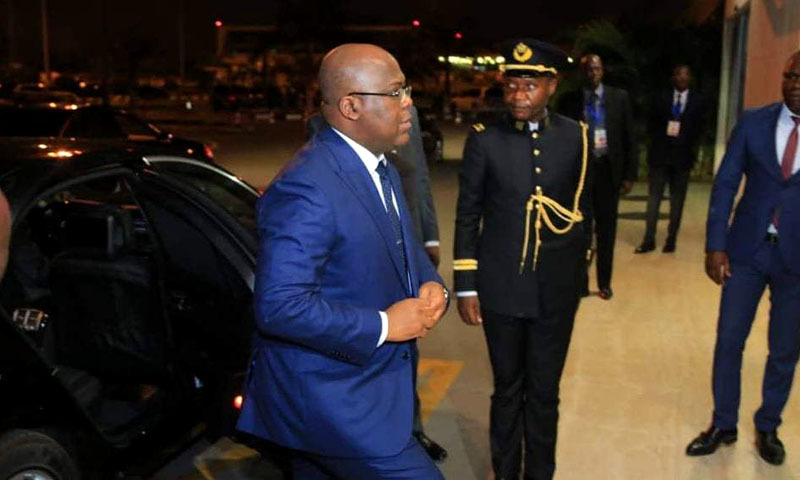 Second post border traffic volume and first land border post, the port of Kasumbalesa is included in the agenda of the President of the Republic, Felix Tshisekedi Tshisekedi Tshilombo, on the move since Friday, April 12, 2019 in the copper capital, Lubumbashi. He will chair a meeting of the High Council of Defense as senior civil and military defense security officers. During his working stay, the Head of State intends to also meet the officials of the Government of the Republic concerned by the operation of the Kasumbalesa border post. This high-profile meeting comes just weeks after the Zambian side closed its border for three days in response to growing insecurity among its nationals and drivers of heavy trucks on Congolese soil. Proof of the magnitude of the issue- the Congolese customs daily records an average of one hundred and ninety trucks and almost five hundred in imports. These machines essentially produce mining products from adjacent products, while a range of manufacturing products, including mining equipment and other consumer goods, daily enter in this door. In recent years, several works have targeted the road infrastructure. The idea is to ensure the opening of this part of the country to neighboring countries and mining sites. Precisely, the security question will certainly invite in the discussions expected on the port of Kasumbalesa. Apart from security, there is also an inventory of certain major reforms, including the reduction of border customs formalities and the decongestion of the exit route to Kasumbalesa. As a reminder, the first stone of the construction of the dry port was laid by the former president, Joseph Kabila, in 2018.